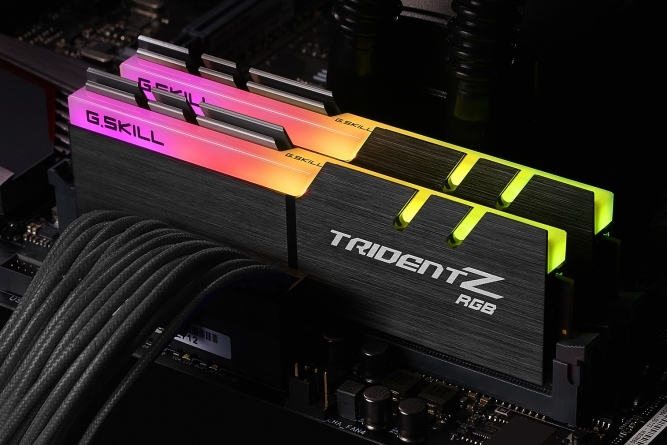 G.Skill announced today a new Trident Z RGB kit which is now the fastest DDR4 memory kit in their product stack. The new dual-channel kit is designed for Z370 platforms and Intel’s Coffee Lake CPUs. The new sticks operate at a blazing fast DDR4-4700 using 1.45V and are the first sticks to reach that speed, period, as well as the first to have RGB LEDs. G.Skill’s fastest-yet DDR4 memory kit has a combined capacity of 16GB in 2x8GB sticks. Timings are set at CL19-19-19-39 at 1.45V. The voltage is a far cry from the 1.2V JEDEC specification at much lower speeds, so considerations regarding the quality of the motherboard's DRAM VRMs should be taken into account. According to G.Skill, stable performance of these sticks was captured on an MSI Z370I Gaming Pro Carbon AC motherboard running in Dual Channel mode. The Mini-ITX board uses two DRAM slots for one DIMM per channel (other boards have two DIMMs per channel) in an effort to have cleaner data pathing and stable power for maximum DRAM clocking potential. Some setups may have trouble reaching these speeds so the ability of the CPU IMC and motherboard is certainly a consideration to run this kit. The new Trident Z RGB DDR4-4700 kits are based on Samsung's B-die ICs produced using 20nm process technology. These memory ICs have been used across several makers over the past couple of years now and with this maturity, know what to expect from them even with a ~20% overvoltage applied. The G.Skill Trident Z RGB kit comes with their brushed aluminum heat spreaders which do not stand too tall over the DRAM PCB itself. The shorter height of the heat spreaders will allow for better compatibility for CPU heatsinks. The Trident Z RGB kit uses the integrated XMP 2.0 profile for easy setup and application of the correct timings, sub-timings, and voltage. 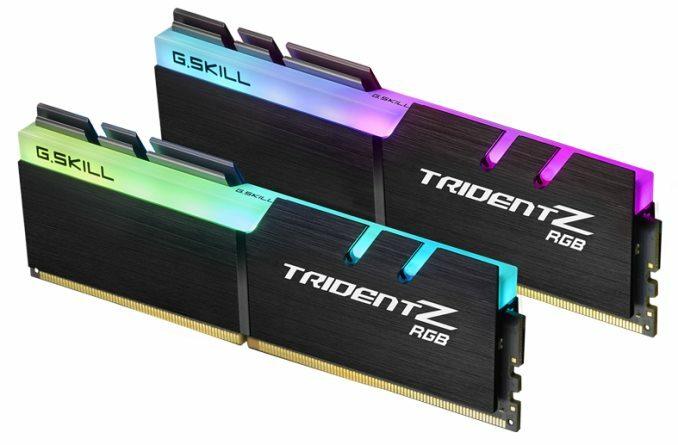 G.Skill's new Trident Z RGB (2x8GB) DDR4 4700 kits will be available in 2Q 2108 and they will not be cheap. A price was not released, however, their Trident Z RGB 4266 kit is currently $330 at Newegg so we can expect it to be higher. There are two indices that people care about, latency and throughput, and stating freq. and CAS is exactly that (although you have to recalculate latency from cycles to (n)seconds. 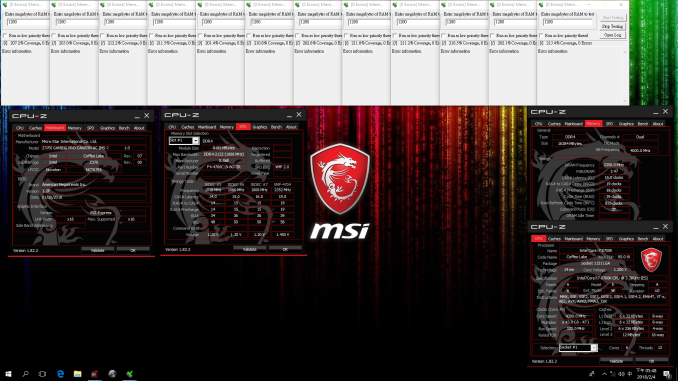 It's CL19 running at 4.7GHz making the latency 4,05ns. Your 3GHz chips have 5ns latency. The higher clock means better throughput, so no. This is faster. Frequency has far, far more impact on performance for games than latency. >Are gamers really this gullible?